Our commercial automated pivot doors are typically used as entrances to buildings with high traffic flow such as reception areas to schools, offices and public buildings. Their pivoted 90º opening action is ideally suited for narrow lobby areas. 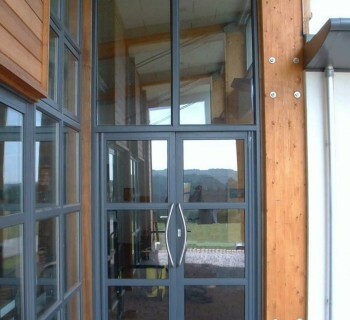 The doors are a bespoke product and can be adapted depending on the application desired. A wide choice of handles are also available. Commercial pivot doors are internally beaded for security and can be alarmed. With slim sight lines, these high performance doors are aesthetically pleasing and require the minimum of maintenance. They are supplied in white as standard but can be powder coated in any standard RAL colour to meet your specific requirements. High energy efficiency sealed glass units are available in a large number of styles and can be tailored to your needs. Door handles – Supplied as standard with hook lock and double pad handle. A commercial door system is designed to be very versatile with the different locking and handle arrangements available due to its design. These can be discussed at time of order.